Stainless-steel appliances have clean lines and the appearance of a professional kitchen. When updating the refrigerator, oven and microwave to stainless steel, an older dishwasher will not match the other appliances. If the dishwasher is still in good working order, a film that looks like stainless steel can be applied easily to the front cover to tie in with the kitchen. The film has soft metal fibers inside to feel and look identical to stainless steel. Updates to a dishwasher can change the exterior appearance to match other appliances. Wash the front of the dishwasher with a solution of mild soap and water on a dishcloth. Remove all dust particles and spills thoroughly. Rinse with a dishcloth and clean water. Dry the dishwasher door thoroughly with a dry towel. Peel the backing off the dishwasher cover that came with the kit. Pull the backing off, starting at one corner like a sticker, and dispose of the backing. Hold one hand at each of the top two corners and stick them to the top of the dishwasher door. Hold the excess of the cover away from the dishwasher. Smooth a 3- to 4-inch-tall section side to side with the squeegee in the kit, beginning at the top and working down. Rub the squeegee in up-and-down strokes and work from one corner across to the other side and then from that side back to the first side. The squeegee smooths out any air bubbles that form underneath the cover. Leave 1/4 inch excess on all four sides and cut any amount over that off with a utility knife. Press the squeegee along the 1/4-inch excess and push it into the dishwasher framework on all four sides so that it sticks inside the frame. Work any air bubbles out with the squeegee so the entire surface is flat. Use a utility knife to pierce the center of small air bubbles and press the bubble inward on all sides to remove the air. 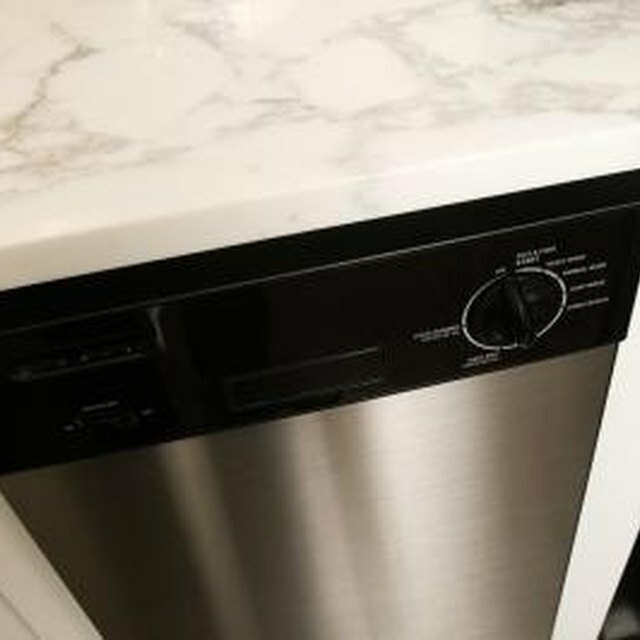 To remove large air bubbles when installing the film, lift the film back up and off the dishwasher door to detach it and start over at the top. A small self-adhesive dishwasher kit covers the door only. A large kit covers the door and the kick plate beneath the door. Apply the kick plate portion in the same manner as the door.